Skånsk mustard comes from the south of Sweden, and it’s commonly found smeared all over hot dogs, as well as serving as a traditional accompaniment to a Christmas ham. It’s a coarse-grained condiment, made with a mixture of seeds supported by a sweet underbelly of honey. It’s excellent with anything strong and robust – sausages, hams, smoked fish. There isn’t much to this recipe, just a little combining of ingredients and a quick blend. 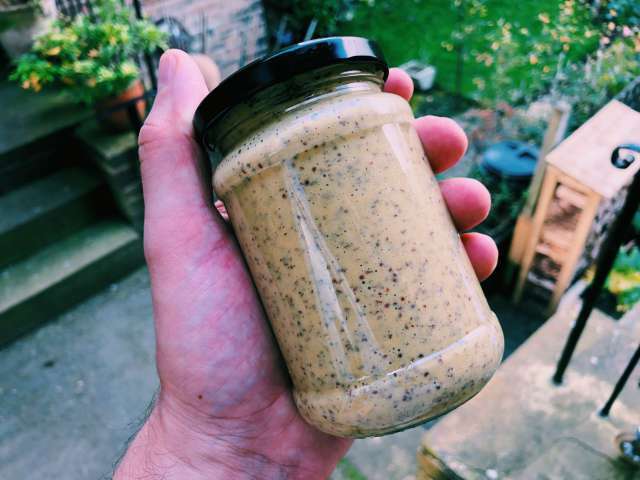 A quarter of an hour’s work now will gift you a jar of Skånsk mustard to sit quietly and unobtrusively in the fridge until it’s moment to significantly improve an otherwise uninteresting plate of leftover meat or fish arrives. Combine 30g each of brown and yellow mustard seeds in a small pan, and cover with 100ml of water. Bring the water to the boil, turn off the heat and let the seeds steep for ten minutes. Transfer the seeds and water to the jug of a blender and add two teaspoons of white wine vinegar, two tablespoons of honey, half a teaspoon of salt, a tablespoon of vegetable oil, half a teaspoon of dried tarragon, and two teaspoons of cognac, although I substituted whisky to no ill effect. It’s worth noting that a blender really is the tool for this particular job, My food processor simply stirred everything around very quickly without crushing the seeds, which is the whole point. The blender made short work of everything. Blend and mix to a smooth paste, carefully adding a splash more water if necessary, and scrape the mixture into a sterilised jar. This should keep for about six months in a cool dark place, maybe longer in the fridge. This recipe is from Nikla Ekstedt’s Food From the Fire, which I’ve found quite absorbing recently. It’s a cookbook dedicated to cooking over open flames. Think campfires in the middle of forests, fish steaming on a bed of dill over some hot coals, big jackets, woolly hats, beards … that sort of thing. It’s a lovely book.